Ivaylo Ditchev – Citizens Beyond Places? title: Citizens Beyond Places? New Mobilities, New Borders, New Forms of Inhabiting Space. To say that those phenomena are becoming ‘fluid’ – or in the words of Zygmunt Bauman whom Ditchev quotes repeatedly, that they are being ‘liquefied’ – is not enough. That is because classical modernity too, as we know it, cannot be conceived of without the perpetual movement, without the revolutions (industrial, political, cultural), without the experiments (in science but also upon itself), without the ‘creative destruction’, without the individualization, constant differentiation and multiplication of differences, without the transcendence of boundaries as an endless task… It is no coincidence that Martin Albrow sees – in a paradoxical way – the difference between the ‘global’ and the ‘modern’ age in that the global has a material referent (the globe), while ‘the modern is the abstract quality of a historical period’ and, hence, ‘at first reading’ it does not refer to anything that is material and readily identifiable. It seems to me that the key problem for Ivaylo Ditchev is the ‘crisis of places’ in the contemporary era, even though he uses this phrase in a narrower sense in his book. Generally speaking, in high modernity, mobility, expansion, the transcendence of boundaries, were seemingly always oriented: from topos to topos. High modernity destroyed and created physical places (including in the form of war or postwar reconstruction), migration was from the South to the North, from villages to towns, citizen participation had its public places, and so on. In the contemporary world, as Ditchev shows, ‘problems are not resolved through battle and conflict but, rather, through “flight, escape, evasion and avoidance”’ (at that, without a strictly fixed direction); ‘the colonization of spaces’ is done above all in the virtual world; the former distinctly structured communities and subcultures become elements of what is defined in the book as a ‘scene’; even the body, as the zero point of place and as a symbol of citizen participation, is overcome in the ‘non-conflictual character’ of interactions on the web, with far-reaching consequences for citizen participation itself. In this sense, the boundaries are not merely redefined, transcended or eliminated; they are established in a new, often imperceptible, way, or they are ‘privatized’ in the literal and figurative sense of the word. Identities are not merely ‘liquefied’, there is a notable multiplication ‘of the life-flows, an effort to accommodate parallel lives’. Space is also being multiplied, by constructing ‘an ever growing number of phantasmal “other scenes” on which the Self realizes its desires beyond cultural sanction’. To my mind, the title of the book, Citizens Beyond Places, should be read from this perspective as well: with an emphasis on the preposition ‘beyond’. This, however, presupposes a non-normativist – sociological – conception of citizenship, such as is declared in the book: not simply as ‘rights and duties, but also as a set of real practices of participation in public life, as well as of the competencies that make it possible’. This is a critical position which Ivaylo Ditchev has consistently taken in a series of studies conducted between 2001 and 2008. On the basis of those studies, in Citizens Beyond Places he demonstrates the dimensions of the above-mentioned problems by examining concrete practices in Bulgaria in the last twenty years. Furthermore, this perspective on citizenship enables him to show also an image of socialism that is probably surprising to many readers: dynamic and mobility within the limits of structures that are otherwise static and delimited by carefully drawn boundaries. For example, the surprising observation that there was a kind of ‘creative destruction’ under socialism as well: the incompletion and flaws of the new dwelling, the ‘half-doneness’ of the newly purchased car that provoke the imagination of the owner, binding him or her to the product, and so on. Or the view of communism as a ‘school for consumers’. The analyses of concrete historical practices are the true substance of the book – contrary to the impression that might have been created in the first part of this review, which focuses on the theoretical horizons of the book. The theoretical reflections in it indeed remain ‘horizons’ which, however, predetermine the author’s subtle observations and enable him to formulate a series of important questions that will most likely be the subject of future studies. Speaking of theoretical horizons, here I must note something that is of significant importance (to me, at least). Ivaylo Ditchev’s book is a good example of harmonization of intellectual style and investigated reality. The author relies less on well-defined, stable concepts – instead, he provokes the language of participants so that the investigated scenes can expound their self-description. 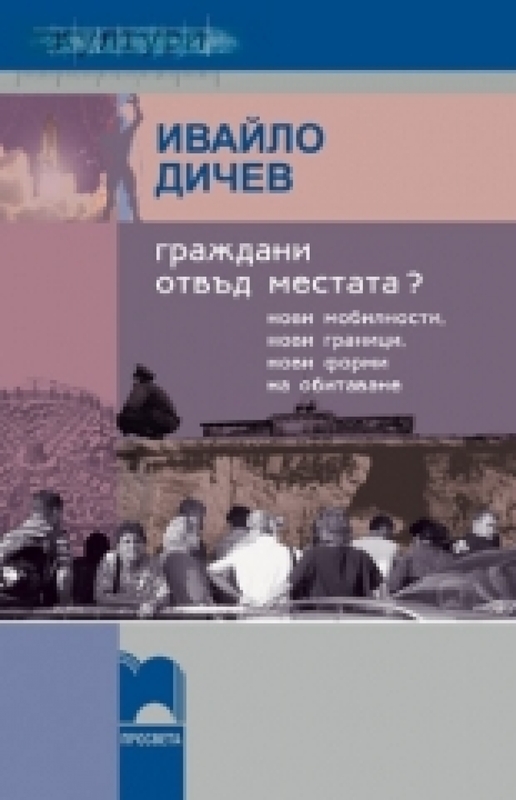 Hence also my concern upon agreeing to review Ditchev’s book: it is not only that the metalanguage of a review can hardly recreate the plasticity and imagery of Citizens Beyond Places but that it probably also misses the most important thing in it, which can be grasped solely through live reading.